Iran-Evin 25 Oct.2012: According to reports from Iran, Nasrin Sotoudeh has been transferred to emergency care. Nasrin has been on hunger strike in protest against her situation in prison and pressures brought against her family, husband, and little daughter. 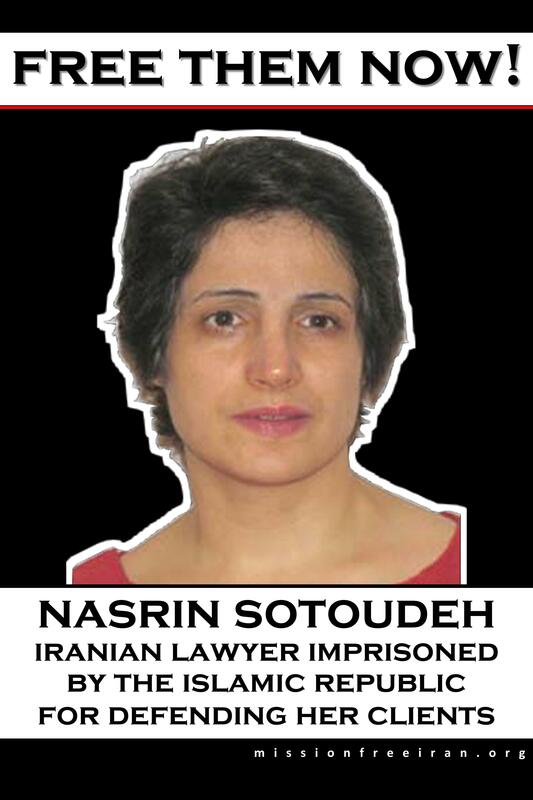 Nasrin, a lawyer of 1st degree with a history of defending juveniles against Islamic prosecution, has been in Evin since 4 September 2010 on specious charges of “acting against the state’s security and propagating against the regime”! Thugs and cutthroats of executioner Seyed-Ali (Khamenei) are punishing Nasrin for her defiance by preventing her from meeting with her young children. Although Nasrin has said that the hunger strike is the only way left for her to protest, we hope she will break her strike. Nasrin is not alone and has everyone in Evin, Iran and the humane world with her. The world is fighting for freedom of Nasrin and all other political prisoners. « Ali Nejati was Prosecuted Today — Condemn Harassment of Labor Activists in Iran!